Voci principali: Primates, Classificazione dei mammiferi. ^ a b E. Louis Jr., Engberg, S.; McGuire, S.; McCormick, M.; Randriamampionona, R.; Ranaivoarisoa, J.; Bailey, C.; Mittermeier, R. & Lei, R., Revision of the Mouse Lemurs, Microcebus (Primates, Lemuriformes), of Northern and Northwestern Madagascar with Descriptions of Two New Species at Montagne d’Ambre National Park and Antafondro Classified Forest (PDF), in Primate Conservation, vol. 23, 2008, pp. 19–38, DOI:10.1896/052.023.0103 (archiviato dall'url originale il 5 febbraio 2009). ^ a b Olivieri, G., et al, The ever-increasing diversity in mouse lemurs: Three new species in north and northwestern Madagascar., in Molec. Phylogenet. Evol. 2007; 43 (1): 309-327, DOI:10.1016/j.ympev.2006.10.026. ^ Radespiel U et al, First indications of a highland specialist among mouse lemurs (Microcebus spp.) and evidence for a new mouse lemur species from eastern Madagascar, in Primates 2011. ^ New Primate Species Discovered on Madagascar, su pressrelations.de. ^ a b (EN) Rasoloarison R.M., Weisrock D.W., Yoder A.D., Rakotondravony D., Kappeler P.M., Two new species of mouse lemurs (Cheirogaleidae: Microcebus) from Eastern Madagascar, in International Journal of Primatology, vol. 34, 2013, pp. 455–469, DOI:10.1007/s10764-013-9672-1. ^ a b (EN) Groves C. & Shekelle M., The Genera and Species of Tarsiidae (PDF), in International Journal of Primatology, vol. 31, nº 6, 2010, pp. 1071–1082, DOI:10.1007/s10764-010-9443-1. 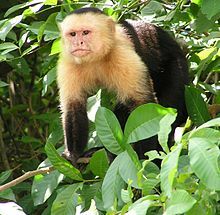 ^ a b (EN) Jessica W. Lynch Alfaro, José De Sousa E Silva e Anthony B. Rylands, How Different Are Robust and Gracile Capuchin Monkeys? An Argument for the Use of Sapajus and Cebus, in American Journal of Primatology, vol. 74, nº 4, 1º aprile 2012, pp. 273–286, DOI:10.1002/ajp.22007. URL consultato l'11 febbraio 2018. ^ (EN) Wallace R.B., Gómez H., Felton A., Felton A.M., On a New Species of Titi Monkey, Genus Callicebus Thomas (Primates, Pitheciidae), from Western Bolivia with Preliminary Notes on Distribution and Abundance (PDF), in Primate Conservation, vol. 20, 2006, p. 36, DOI:10.1896/0898-6207.20.1.29 (archiviato dall'url originale il 25 aprile 2012). ^ (EN) Defler TR, Bueno ML and García J, Callicebus caquetensis: A New and Critically Endangered Titi Monkey from Southern Caquetá, Colombia (PDF), in Primate Conservation, vol. 25, 2010 (archiviato dall'url originale il 23 agosto 2011). ^ (EN) Vermeer J. and Tello-Alvarado J.C., The Distribution and Taxonomy of Titi Monkeys (Callicebus) in Central and Southern Peru, with the Description of a New Species, in Primate Conservation, nº 29, 2015 (archiviato dall'url originale l'8 luglio 2015). ^ (EN) Dalponte J.C., Ennes Silva F., José de Sousa e Silva Júnior, New species of titi monkey, genus Callicebus Thomas, 1903 (Primates, Pitheciidae), from southern Amazonia, Brazil (PDF). ^ (EN) Gualda-Barros J., Nascimento F.O., Amaral M.K., A new species of Callicebus Thomas, 1903 (Primates, Pitheciidae) from the states of Mato Grosso and Pará, Brazil (PDF), in Papéis Avulsos de Zoologia, vol. 52, nº 23, 2012, pp. 261–279, DOI:10.1590/s0031-10492012002300001. ^ John A. Hart, Kate M. Detwiler, Christopher C. Gilbert, Andrew S. Burrell, James L. Fuller, Maurice Emetshu, Terese B. Hart, Ashley Vosper, Eric J. Sargis, Anthony J. Tosi, Lesula: A New Species of Cercopithecus Monkey Endemic to the Democratic Republic of Congo and Implications for Conservation of Congo’s Central Basin, in PLoS ONE 2012; 7(9): e44271, DOI:10.1371/journal.pone.0044271. ^ Davenport T.R.B. et al, A New Genus of African Monkey, "Rungwecebus": Morphology, Ecology, and Molecular Phylogenetics, in Science 2006 Vol. 312. no. 5778, pp. 1378 - 1381, DOI:10.1126/science.1125631. ^ (EN) C. Groves, The taxonomic diversity of the Colobinae of Africa, in Journal of Anthropological Sciences, vol. 85, 2007, pp. 7-34. ^ Van Ngoc Thinh, Alan R. Mootnick, Vu Ngoc Thanh, Tilo Nadler, Christian Roos, A new species of crested gibbon, from the central Annamite mountain range, in Vietnamese Journal of Primatology 2010; 1(4): 1-12. (EN) Colin Groves, Mammal Species of the World. A Taxonomic and Geographic Reference, a cura di D.E. Wilson e D.M. Reeder, 3ª ed., Johns Hopkins University Press, 2005, pp.111-184, ISBN 0-8018-8221-4. (EN) Kingdon J., Primates, in The Kingdon Field Guide to African Mammals, Bloomsbury Publishing, 2015, p.190. Gippoliti S., Visalberghi E. Ordine Primates: elenco delle viventi, nome italiano e grado di minaccia. Rivista di Antropologia (Roma), Vol 79 (2001), pp 33–44. Andriaholinirina, N., Fausser, J., Roos, C., Rumpler, Y., et al, Molecular phylogeny and taxonomic revision of the sportive lemurs (Lepilemur, Primates), in BMC Evolutionary Biology, vol. 6, 23 febbraio 2006, p. 17, DOI:10.1186/1471-2148-6-17. Edward E. Louis, Jr., Shannon E. Engberg, Runhua Lei, Huimin Geng, Julie A. Sommer, Richard Randriamampionona, Jean C. Randriamanana, John R. Zaonarivelo, Rambinintsoa Andriantompohavana, Gisele Randria, Prosper, Boromé Ramaromilanto, Gilbert Rakotoarisoa, Alejandro Rooney, and Rick A. Brenneman, Molecular and morphological analyses of the sportive lemurs (Family Megaladapidae: Genus Lepilemur) reveals 11 previously unrecognized species (PDF), in Texas Tech University Special Publications, nº 49, 2006, pp. 1-49 (archiviato dall'url originale il 5 giugno 2011). Mathias Craul, Elke Zimmermann, Solofo Rasoloharijaona, Blanchard Randrianambinina and Ute Radespiel, Unexpected species diversity of Malagasy primates (Lepilemur spp.) in the same biogeographical zone: a morphological and molecular approach with the description of two new species, in BMC Evolutionary Biology, vol. 7, 31 maggio 2007, p. 83, DOI:10.1186/1471-2148-7-83. Hoffman M, Grubb P., Groves C.P., Hutterer R., Van der Straeten E., Simmons N., Bergmans W., A synthesis of African and western Indian Ocean Island mammal taxa (Class: Mammalia) described between 1988 and 2008: an update to Allen (1939) and Ansell (1989), in Zootaxa, vol. 2205, 2009, pp. 1–36.